In part 3 of our five-part series on eliminating Microsoft technology in a modern organization, we take a look at email servers. Microsoft has owned the email infrastructure for companies for almost two decades. Their Exchange email server has been a mainstay in small and large IT organizations worldwide. The world has moved to the cloud, and email was one of the first major services to make that leap. Today, major solutions from Google (G Suite) and Microsoft (Office 365) are shifting email to the cloud. 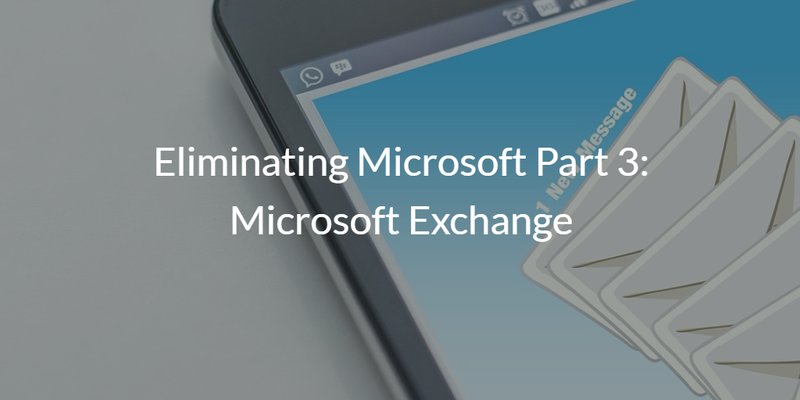 Initially introduced in 1993, Microsoft Exchange became a major hit. The alternatives at the time were open-source email servers and Lotus Notes. It was clearly a different time. Installing an email server was a major initiative because many companies did not have Internet connections or domain names to start with. Just taking these two initial steps was significant for organizations at that time, so imagine the complexity involved when they added an email server to the mix. They then needed to decide how they wanted to use email, who would have access to it, and how to implement it. While we take those decisions for granted today, they were serious issues at that time. Most organizations chose the Microsoft Exchange platform. This was due to two major reasons. First, organizations at that time were predominantly based on the Microsoft Windows platform. Second, Microsoft created an email client called Outlook. Both of these were significant steps for organizations. Not only was email a new communication vehicle at the time but also a shift for many professionals in their approach to work. By integrating this new medium into platforms that were already understood, it made it easier for the organization to adopt email. As a result of Microsoft’s strategy to own the client and the server, Exchange became the runaway market share leader. Even in the early years, Exchange wasn’t without competition. Lotus, Netscape, and a variety of smaller providers created email servers. Microsoft ultimately won the battle due in no small part to Active Directory, which is another Microsoft-produced product. The AD and Exchange duo became the back-office function and platform for most IT organizations. By creating users in Active Directory, they were able to be easily provisioned to their email in Exchange. The tight integration between AD and Exchange created the functions that end users needed – email and access to their machine or the domain. From an IT perspective, it was easy to provision and deprovision. Microsoft was ticking along and owned the back-office IT functions with Active Directory and Exchange. 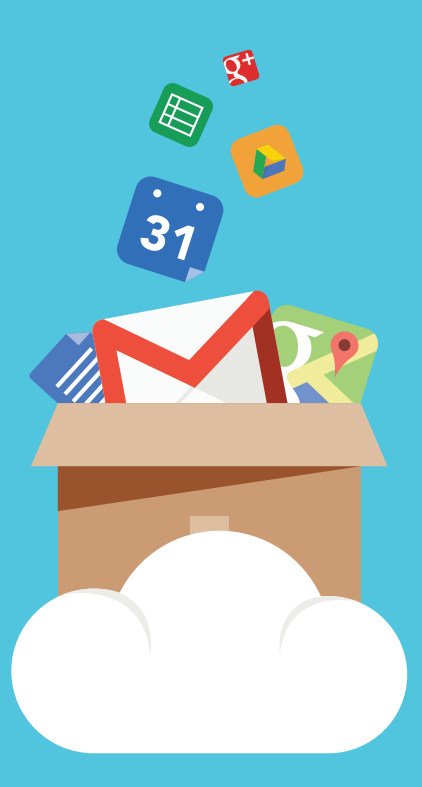 That all changed when Google created Google Apps (now known as G Suite). Not surprisingly, Gmail was a hit. In addition to providing a free email service, Google took the step of letting organizations outsource their email server. This was a major step forward, but it was not without controversy. Switching from Exchange to a cloud email server was not a widely accepted approach. Over time, though, GApps did an excellent job of eliminating Exchange. IT admins realized that Google would do a better job of hosting their email and keeping it running smoothly. As Google Apps made significant inroads, Microsoft understood the damage that was being done to their email server business. So they countered with Office 365. O365 also eliminated the need for Exchange. There is little doubt that over the next few years that the vast majority of organizations will eliminate their on-prem Microsoft Exchange server in favor of cloud-hosted email. Of course, one of the reasons that many organizations have hesitated to move to cloud email from G Suite or O365 has been the tight integration with Active Directory. By creating and managing users from Active Directory, IT admins have a seamless way to manage their users inside Exchange. If they move to cloud email, it is more difficult to control it from an on-prem AD. There is good news, though. Just like there were innovations to eliminate Exchange, a modern Directory-as-a-Service® platform is eliminating Active Directory and shifting it to the cloud. As a cloud-hosted directory services solution, it integrates with G Suite and Office 365 to create that same AD/Exchange type of combination. Except it’s better because it’s an all cloud-based platform instead of based on the Microsoft stack of solutions. Eliminating Microsoft Exchange within an organization is not only about decreasing reliance on Microsoft, but it’s also about creating massive efficiency for IT organizations. G Suite and Office 365 are common solutions for hosted email and when combined with Directory-as-a-Service, IT admins can shift their back-office platforms to the cloud.